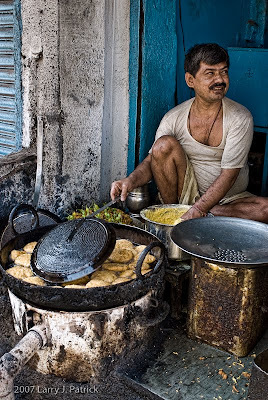 Within all Indian markets, there is a collection of food vendors who prepare unusual dishes on the spot. The smells of these dishes were amazing—I must admit that neither JD or I tried any of them because, well, to be honest, we just were afraid of getting the famous “Delhi Belly.” Almost everyone we know that have been to India had at least one episode of “Delhi Belly.” We were determined not to get it; and, fortunately, because of being very careful, neither one of us got it. Even though I never had any intention of eating anything from any of these vendors, I did enjoy smelling the food and watching them prepare them. The chef in this photo had long lines of people lined-up to eat his food, and in all honesty, it looked and smelled wonderful. I wanted the photo to be about his world of food. Camera settings: Nikon D200, Nikon 28-70mm f/2.8 at 28mm shot at ISO 100, f/5.6and 1/30th of a second. I think I understand why you did not eat at these stalls. Good job showing another side of the world. Another good photo of everyday life in India. I do wish that he was looking at you rather than off to the side. I think it would make a more intimate photo. Interesting photo, but I do wish that I could better see what is in the various pots. I am with Debbie, pretty sure I would not eat anything from him. Like Sya, I wish he was looking at you. Otherwise, I think it is a good example of life in India.